Former Counterterrorism specialist JT Patten has created an unsafe view of the world from one of the safest places in America--Naperville. NAPERVILLE, Ill. - May 26, 2016 - PRLog -- Best selling thriller author, J.T. 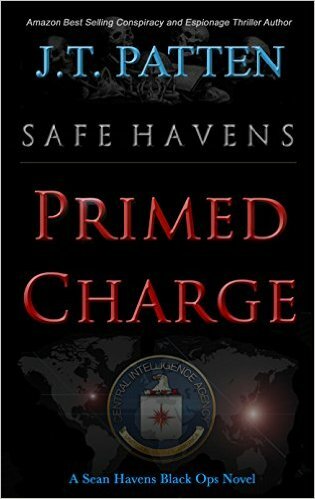 Patten has penned his second spy thriller, SAFE HAVENS: PRIMED CHARGE, which has been described as one of the most authentic dark espionage and black ops novels in the genre. Patten, who has a background in counterterrorism intelligence, released his first thriller, SAFE HAVENS: Shadow Masters in 2014 surprising critics with success on the same best selling lists as Brad Thor, Vince Flynn, and Lee Child. "I had chosen to forego traditional publishing routes to ensure that my book was properly reviewed by the government and military before release. Some publishing houses pay lip service to authors with strict security restrictions on public release information only to find the publisher never submitted the manuscripts for review. I wasn't going to take any chances in upholding my obligations. I also wanted to maintain control of the novel in the event that some individuals or entitities decided later that some sources and methods described in the novel hit too close to home. I was very careful, but sometimes creativity hits on something that an individual may not be aware is sensitive," stated Patten. Patten's latest thriller brings readers into deep and dark conspiracies with warring political and secret society factions. Readers have described the books as "not for the faint of heart" but probably the closest anyone can get to the underground world of discrete operations. For Naperville and Chicago residents, they will appreciate subtle nods to the city and various Easter Eggs of Naperville's streets used as character names. When asked about the dark nature of his books, Patten replied, "I'm not pulling punches on describing the seedy nature of the world or the brutality that escapes the public eye. This book is not for lovers of happy endings, clear lines of good and evel, unicorns or rainbows. If you read it, you will feel uncomfortable and bothered. That's the world that exists beyond locked doors and the safe communities in the Midwest such as Naperville. That's the realm of the possible that I share with readers. If you don't like that, by all means, don't read the book if you can't handle "the black." That said, those intreagued by the world of conspiracy, skullduggery, and heroism by everyday patriots, may find that they can't get enough of these unique novels. Fresh, different, and unexpected. Pick up a copy today on Amazon, B&N, or Anderson Books in Downers Grove.